The Black churches have a long history of campaigning in the church house. I don't think these Black preachers have a clue that this is illegal and a violation of their status with the IRS as a nonprofit corporation. A Non-Profit-Corporation has NO rights. They are an instrumentality of the US Government. White Fundamental and Evangelical churches are just as stupid about this. I keep warning you that you NPC people are NOT free. You cannot bellyache when the IRS demands that you observe certain rules. You have put Caesar on the church board, and Caesar helps you take the abundant offering via tax receipts. You CANNOT have it both ways. During the last election, many Fundamental pastors campaigned from their bully pulpits for George Bush in only slightly guarded terms. If you will not unregister your church and restore it to a historic church states legally, you will soon be told which parts of the Bible you cannot preach from. Frankly, I look forward to this day, for you money grubbers will lose you godly people, and I shall help them start house churches which are separated and ready for the rapture. Your state church is right in line with the future antichrist system soon to come. 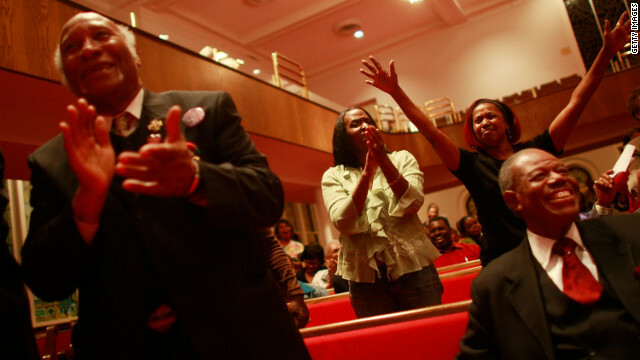 Above is an Obama campaign rally in a Black church. There is a civil rights attitude in Black churches that says, "
if you complain, we will scream RACISM." This attitude, among many such attitudes by all races in the USA, will destroy the nation soon. and the holy things that are supposed to happen in church gatherings. the same thing is just as wicked as the Black churches. Rev. Gaston Smith took a break from the revelry and worship of Palm Sunday services to inform the congregation about the inquiry. He said visits by political candidates are nothing new, and that the 75-year-old church did not violate U.S. tax code, as suggested in the letter. He has hired former U.S. Attorney Guy Lewis to defend the church in the inquiry. 'This is not about politics. It's about principles,'' Smith said. Silence fell over the congregation as he spoke. The inquiry raises serious questions about whether the predominantly black church can keep its tax-exempt status. If it fails, members and contributors could not deduct tithes and other gifts, upon which churches heavily rely to operate. Tax Rebellion is VERY often associated with the Unregistered Church.You MUST make a clear distinction between rendering to Caesar what IS Caesar's while not rendering to Caesar what is God's.